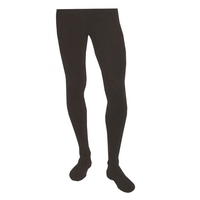 Mens full-fashioned tights with back seam. 100% nylon. Features a comfortable 1" plush waistband. Hand wash, drip dry. Fits men 5'2" to 5'5", inseams from 29 inches to 31 inches.